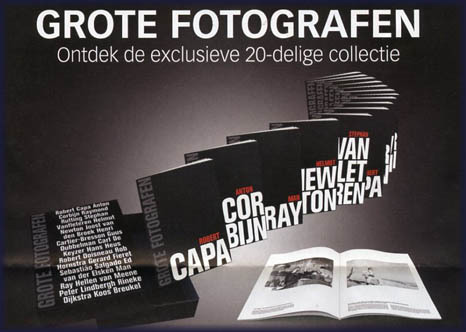 'De Volkskrant' has published for the Netherlands a large-size (30x42cm) box showing 20 brochures of 'great photographers'. Saul Bellow (June 10, 1915 – April 5, 2005) was a Canadian-born American riter. For his literary contributions, Bellow was awarded the Pulitzer Prize, the Nobel Prize for Literature, and the National Medal of Arts. He is the only writer to have won the National Book Award three times, and the only writer to have been nominated for it six times. 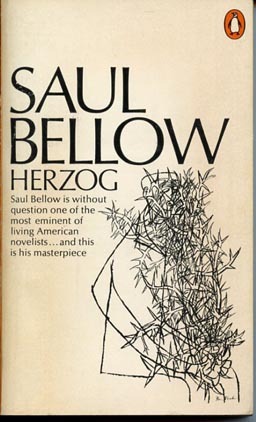 Bellow hit the bestseller list in 1964 with his novel Herzog. He was surprised at the commercial success of this cerebral novel about a middle-aged and troubled college professor who writes letters to friends, scholars and the dead, but never sends them. I found it difficult to keep track of Moses Elkanah Herzog, the rambling American Jewish professor who leads a restless helter-skelter life in relations and moves between various locations. In the process of his journeys, he is moving through his own mental chaos, sorting out memories of his past failures, trying to get a grip on his destiny. At the end of the book when his brother suggested a restful period in a psychiatric institution, I could not have agreed more! Herzog's third(?) wife has left him for another man and he feels betrayed by his ex wife and his friend Valentine Gersbach. Meanwhile he has great difficulty in committing to another relation. And while not exactly a pauper, he has had to borrow money from relatives and seems incapable of properly looking after himself. Look elswhere if you want to identify with a sympathetic main character, but this is a book you will like if you enjoy great writing, appreciate how sentences are masterfully crafted! An inspired selection of Dutch photographers has their work on display in historic, fortified Naarden-Vesting during the period May 21st - June 19th. For centuries the Dutch have a reputation to uphold for quality portraits, think of Rembrandt and Vermeer! In the present day many Dutch manage to uphold that creative and artistic tradition with excellent photography. In the Grote Kerk ('Big Church') a large exhibition is dedicated to the considerable and admirable work of Joost van den Broek. Other photographers on display during this exhibition are Stephan Vanfleteren, Lieve Prins, Susanne Reuling, Janica Draisma, Martin Roemers and many others. The idea is to buy a ticket in the office, explore the map which has the locations where photos are on display. There will also be photographers on display under the banner of ' Festival-OFF'. The Festival-OFF is the collection of all photographers, professionals as well as amateurs who started their own exhibition, at their own risk and expenses. 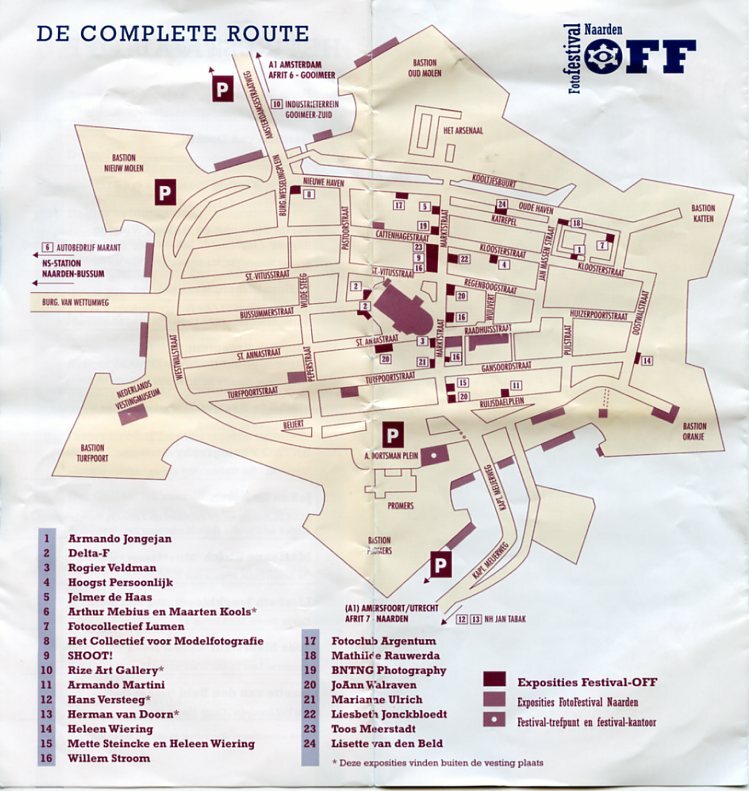 They manage to find exhibtion space each Festival. Some of them do succeed in getting some private sponsoring for framing and printing. The exhibition space is mainly provided by the residents of Naarden-Vesting, in shops, bars and restaurants of this historic town lined with cobble-stoned streets. Any shopwindow, shed or garage will do. Some of the exhibitions are outside (weather proof) or in tents, caravans etc. Participants include Armando Jongejan, Delta-F, Rogier Veldman, Jelmer de Haas, Athur Mebius en Maarten Kools, Fotocollectief Lumen, Collectief voor modelfotografie, Shoot!, Rize Art Gallery, Armando Martini, Hans Versteeg, Herman van Doorn, Heleen Wiering, Mette Steincke en Heleen Wiering, Willem Stroom, Fotoclub Argentum, Mathilde Rauwerda, BNTNG Photography, JoAnn Walraven, Marianne Ulrich, Liesbeth Jonckbloedt, Toos Meerstadt, Lisette van den Beld and Fotobond. Thus you will see photos displayed in various sizes, shape and form; displayed outside as well of course inside, in remarkable locations such as in the fortifications, a barn, shops, restaurants, etc. I particularly liked the photography by Jan Banning, Martin Roemers, Henriette van Gaasteren (a.k.a. 'Lilith'), Mike Roelofs and Joost van den Broek. 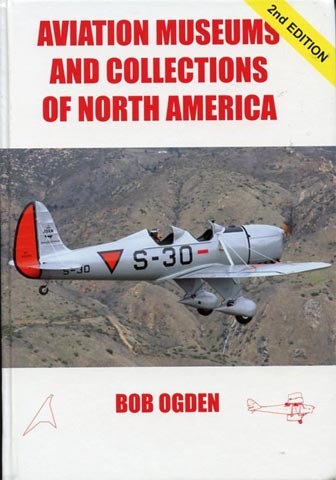 This weekend received my AVIATION MUSEUMS AND COLLECTIONS OF NORTH AMERICA, compiled by Bob Ogden, published by Air-Britain (Historians) Ltd.
A brand-new 2011 copy replacing my 2007 edition. Hundreds of aviation museums, privat collections and now also aviation monuments included. Thousands and thousands of aeroplanes listed. Huge, huge amount of work involved here. Magnificent dedication by Bob Ogden- my first copy dates from 1979, published Airline Publications & Sales Ltd, distributed by Macdonald and Janes, at the time. 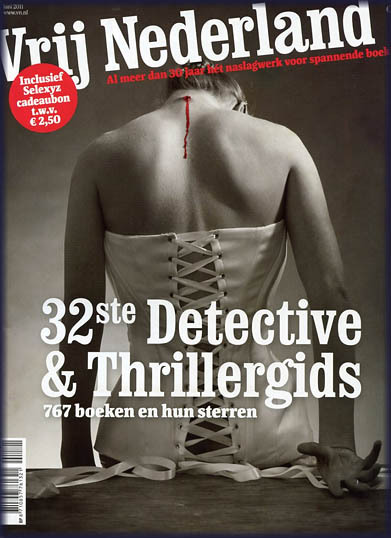 Vrij Nederland (Dutch, published in the Netherlands) has published its 32st guidebook for detective and thrillers published in the Dutch language. 767 Books are reviewed and rated by stars, five stars being the highest scores. This edition has only seven books awarded the five-star status, the Book of the Year selected from these five is Arnaldur Indridason's 'Doodskap' (original title Svörtuloft, not yet translated into English and therefor I haven't read it yet). The other 5-star titles & writers are: De Begraafplaats van Praag (The Prague Cemetery - Umberto Eco), Voor Ik Ga Slapen (Before I Go To Sleep - S.J. Watson), Grijs Verleden (Field Grey - Philip Kerr), Dossier 64 (Journal 64 - Jussi Adler Olsen), De Herziening (The Reversal - Michael Connelly) and Een Mooie Dag Om Te Sterven (The Anniversary Man - R.J.Ellory). After The Band split up in the late 1970s, Canadian singer-songwriter Robbie Robertson (b.1943) has not been very productive in producing albums. Since 1987, he released a limited series of solo albums, his first was self titled followed by 'Storyville', 'Music for the Native Americans' and 'Contact from the Underworld of Redboy'. 'How To Become a Clairvoyant' was recently released and continues his fine story-telling songwriting lyrics. 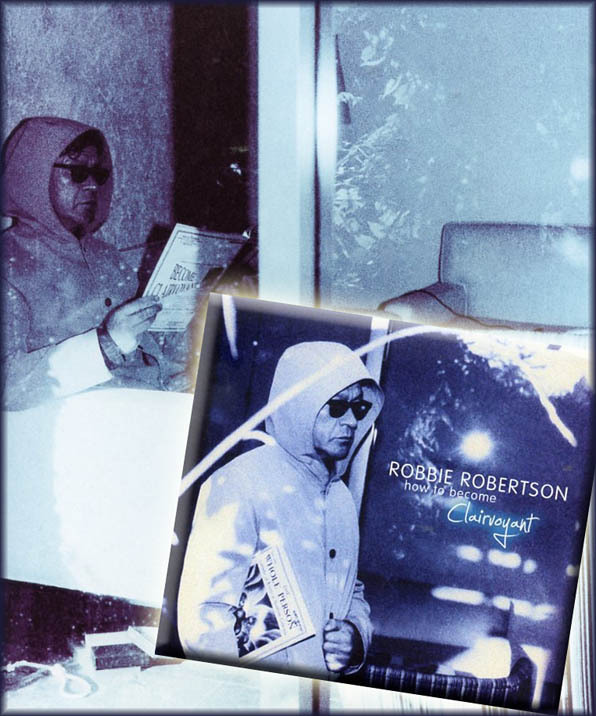 When I noticed the cover I took out an Anton Corbijn Photobook ('33 Still Lives') and indeed found a photo titled 'Robbie Roberston July 1999, Beverly Hills'. In the photo Robbie is reading a brochure Become Clairvoyant. It seems to show the extended time it takes for Mr Robertson to produce an album; is this what he sings about on this album: "I was only trying to make the right mistake". A few days ago, on May 14th, Joseph Wershba passed away. During the 1950s he brought the witchhunt on communists in the US to the attention of the public. He reported on the attempts by the US Air Force to fire Lt Milo Radulovich because of alleged communist sympathies. In 2005 a film was made on this story, titled 'Good night, and good luck', starring Robert Downey Jr in the role of Wershba. Wershba was born on 19Aug1920 and joined CBS News in 1944, serving as writer, editor and correspondent. After a stint as a columnist and feature writer for The New York Post (1958–1964), he returned to CBS. He produced documentaries for 'CBS Reports' and was one of 6 original producers for '60 Minutes' in 1968 (-1988). Joseph Wershba received the Silurian Award for lifetime achievement in journalism. He was also nominated for a Pulitzer Prize for his work on The Lee Harvey Oswald Story in 1963. And again I enjoyed Bukowski's poetry, it is so accessable, brimming with bitter-sweet humor. Henry Charles Bukowski (born Heinrich Karl Bukowski; August 16, 1920 – March 9, 1994) was an American poet, novelist and short story writer. His writing was influenced by the social, cultural and economic ambience of his home city of Los Angeles. It is marked by an emphasis on the ordinary lives of poor Americans, the act of writing, alcohol, relationships with women and the drudgery of work. 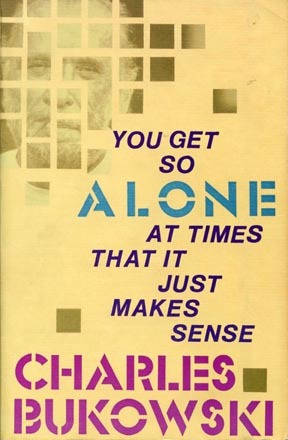 Bukowski wrote thousands of poems, hundreds of short stories and six novels, eventually publishing over sixty books. Last year I purchased this double dvd edition and recently havE been playing it again. So much to enjoy there: the music, information about his 'tools' (e.g. Old Black and Hank Williams guitar), how songs came about; the recordings were made with an audience, but have a great intimacy. In the fall of 2005, Neil Young returned to the sound and style of his iconic 1972 album Harvest with Prairie Wind, a set of ten songs which look to America's past and future accompanied by sweet but rough-hewn country-rock. The album was written and recorded after Young was diagnosed with a brain aneurysm, and shortly before he went into the hospital for surgery (he enjoyed a full recovery) for this, Young played a pair of special concerts at Nashville's Ryman Auditorium, the original home of the Grand Ole Opry, where he performed the Prairie Wind album in full. A selection of old favorites were played too. 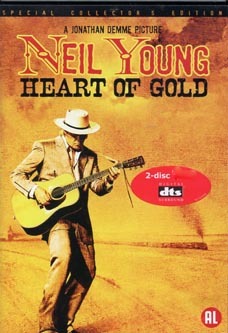 Filmmaker Jonathan Demme was on hand to film the shows, and Neil Young: Heart of Gold was culled from the best moments of those two concerts, as well as interviews in which Young talks about his life and music. Emmylou Harris appears as a guest vocalist, and Young's band includes long time accompanists Ben Keith on pedal steel, pianist Spooner Oldham, Grant Boatwright (acoustic guitar, electric guitar: Old Black! ), and Pegi Young (Neil's wife) on acoustic guitar and backing vocals. 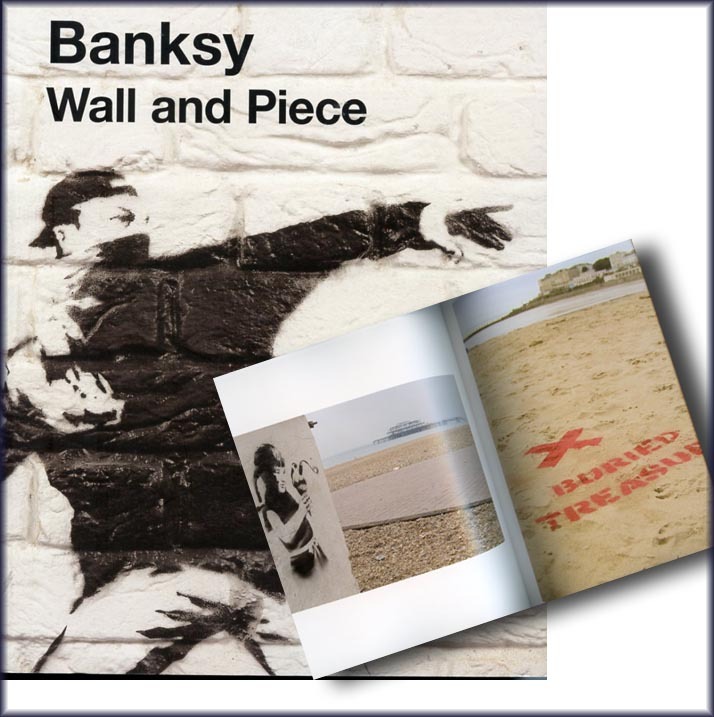 Recently I bought this book: 'Banksy - Wall and Piece' (Random House, 2006) and became convinced that art can be found in grafitti. Humor too. Deep messages made obvious. That's Banksy for you. 'The people who truly deface our neighbourhoods are the companies that scawl giant slogans across buildings and buses trying to make us feel inadequate unless we buy their stuff. They expect to be able to shout their message in your face from every available surface but you're never allowed to answer back. Visit www.banksy.co.uk for his art and wit. Enjoy! Read this morning about Gunther Sachs' suicide (7 May), by a gunwound to the head @home in Gstaad; he'd written "no hope illness A" (some have speculated to be Alzheimer's). 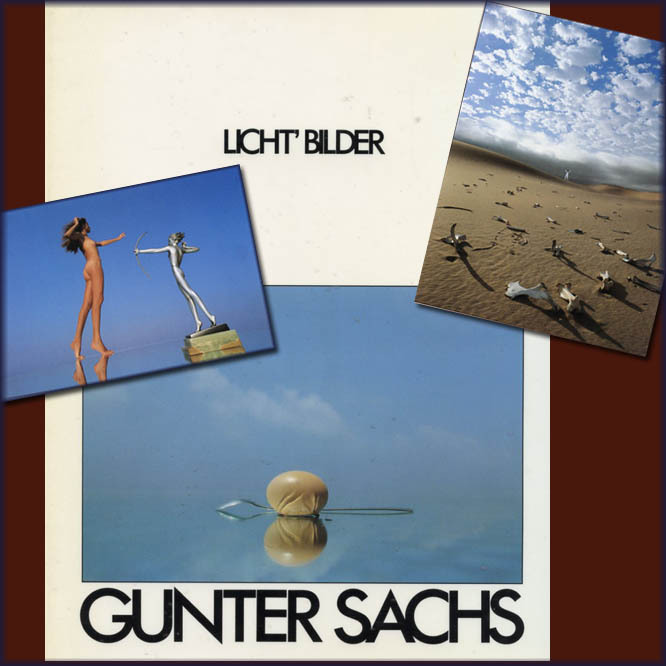 I remember him as a talented photographer and picked up my copy of "Licht' Bilder", a book I bought decades ago. Introduced by Ian Hislop and a word of conclusion by Paul Merton, the writer Nick Martin continues the tongue-in-cheek style as enjoyed on tv in HIGNFY: 'Have I Got News For You'. I must admit that at first I found the cynical humor tiring at first, but then I focussed on the facts discussed and found what I read both interesting as well as amusing. There is a lot of truth in the wry and cynical observations. "Photojournalism is in the midst of a remarkable, and singularly unexpected, renaissance. New practices, strategies, viewpoints, techniques, and agents have radically transformed the institutions and the fundamental concepts of the field. Whilst it has become fashionable to lament the death of photojournalism, actual events suggest that something quite different is taking place. The group exhibition Antiphotojournalism charts these new developments in exciting ways. Included is work by Broomberg & Chanarin, Mauro Andrizzi, Jonathan Cavender, Robbie Wright, Shane McDonald, Hito Steyerl, Ariella Azoulay, Paul Lowe, Goran Galic & Gian-Reto Gredig, Laura Kurgan, Renzo Martens, Kadir van Lohuizen, Allan Sekula, Phil Collins, Walid Raad/The Atlas Group, Paul Fusco, Gilles Peress and Susan Meiselas. Compilations by Sohrab Mohebbi, Eyal Weizman, with Yazan Khalili and Tony Chakar. New methods of reporting the news, new imaginations of what the news might be, have challenged the hegemonic figure of the photojournalist at its core and given birth to the most interesting ideas. This critical approach is called, following Allan Sekula, 'antiphotojournalism'. It has a multiplicity of forms, such as film, video, slides, web-based presentations and many more." Somewhat confusing: the winners and runners up of the World Press Photo 2010 will now be touring as World Press Photo Exhibition 2011. The kick off took place in the majestic Oude Kerk (Old Church) in Amsterdam (Netherlands). The church is quite marvellous too, increase the respect to the human suffering often portraited in these pictures. I've tried to capture that during my visit 04May11. John Ernst Steinbeck, Jr. (February 27, 1902 – December 20, 1968) was an American writer. He wrote the Pulitzer Prize-winning novel 'The Grapes of Wrath' (1939) and 'East of Eden' (1952) and the novella 'Of Mice and Men' (1937). He wrote a total of 27 books, including 16 novels, 6 non-fiction books and 5 collections of short stories. For school I had to read 'literature' and the' Grapes of Wrath' I recall as one of few I really liked. In later years I read a few more of his books, but I hadn't heard of 'The Russian Journal' until my son showed it to me recently. I got to read it a fews days after we'd returned from a six day visit to Moscow. 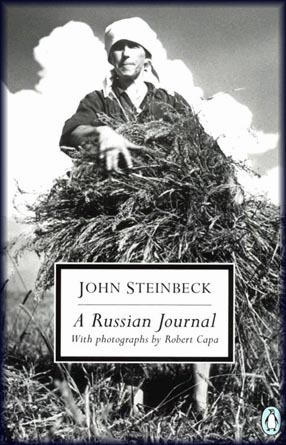 'The Russian Journal' struck a chord because I recognised several observations, which is remarkable as Steinbeck (and Robert Capa) travelled in the USSR in 1948! Steinbeck writes in a very unassuming way, steering away from political statements, with dry wit commenting on travelling conditions, bureacracy and Capa's frustrations (who was suffering more because of limitations set by burocracy to his photography and sensitivity to his equipment). A while ago I visited a photography exhibition in FOAM Gallery (Amsterdam,NL) dedicated to the work by W. Eugene Smith. The exhibition absolutely thrilled me. As a result I ordered a book which showcases his work and although I had to make do with a copy in Spanish (the English editions no longer available and these days an expensive, much-sought-after collector's item), I am very glad to be able to browse in this book every now and then and enjoy the fine social documentary by this decicated photographer. Here is a LINK to some more photos and photos taken during the exhibition. William Eugene Smith (December 20, 1918, Wichita, Kansas – October 15, 1978, Tucson, Arizona) was an American photojournalist known for his refusal to compromise professional standards and his brutally vivid World War II photographs. Smith graduated from Wichita North High School in 1936. He began his career by taking pictures for two local newspapers, The Wichita Eagle (morning circulation) and the Beacon (evening circulation). He moved to New York City and began work for Newsweek and became known for his incessant perfectionism and thorny personality. Smith was fired from Newsweek for refusing to use medium format cameras and joined Life Magazine in 1939. He soon resigned from Life, too. In 1942 he was wounded while photographing battle conditions in the Pacific theater of World War Two. As a correspondent for Ziff-Davis Publishing and then Life again, Smith entered World War II on the front lines of the island-hopping American offensive against Japan. In 1950, he was sent to the United Kingdom to cover the General Election, in which the Labour Party, under Clement Attlee, was narrowly victorious. 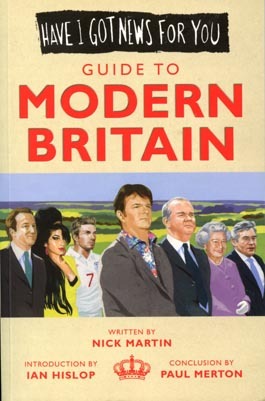 Life had taken an editorial stance against the Labour government. In the end, a limited number of Smith's photographs of working-class Britain were published, including three shots of the South Wales valleys. Smith severed his ties with Life over the way in which the magazine used his photographs of Albert Schweitzer. Upon leaving Life, Smith joined the Magnum photo agency in 1955. In January 1972, Smith was attacked by Chisso employees near Tokyo, in an attempt to stop him from further publicizing the Minamata disease to the world. Complications from his longterm consumption of drugs, notably amphetamine (taken to enable his workaholic tendencies), and alcohol led to a massive stroke, from which Smith died in 1978. Only last year I learned about this fantastic crime writer, having picked up an interest in Scandinavian novelists in recent years. Recently I read the last of the Detective Erlendur series (the translated titles) published sofar and now forced to wait in patience until a new one is published. Arnaldur was born in Reykjavík, the son of writer Indriði G. Þorsteinsson. He graduated with a degree in history from the University of Iceland in 1996. He worked as journalist for the newspaper Morgunblaðið in 1981-1982, and later freelanced. From 1986 to 2001, he was a film critic for Morgunblaðið. He published his first book, Sons of Dust (Synir duftsins) in 1997, the first in the series of Detective Erlendur. The series includes eleven novels as of 2010. Arnaldur's books have been published in twenty-six countries. 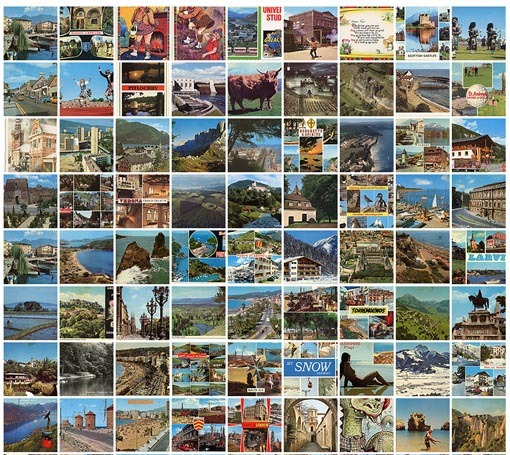 It seems that sending postcards from holiday destinations or from abroad for any number of reasons has become a fading tradition. It was a way to stay in touch and these days there are so many other means to do so. It struck me how most had little information written on the back anyway, even 'greetings' was often too much of an effort it seems. Others wrote so much and so small that it was hardly readable. As a tribute to these postcards, which had their heyday on the 1960s, 1970s and early 1980s, here is a collection I scanned which were sent to my parents mostly, some of them to me and my brothers when we lived at home. But who was Antonietta who sent me a postcard from Ponte di Legno in june 1977 ??? In a book I found this old money transfer; probably stems from the 1960s. It may have been payment for the book I found it in and forgotten to be sent. This was used in the Netherlands. Last december I bought a new desktop computer. It is one by HP (HP5245NL) and I don't much care for the rubbish they put on it, but in time I'll remove most of it or perhaps make a clean reinstallation of Windows. The keyboard was unfamiliar, maybe US, getting used to it was no option because it would still be too different from my laptop and pc's at work; so I bought a wireless keyboard & -mouse from Logitech. It doesn't look like Microsoft has much learned from bloddy Vista, it is the same security paranoia crap all over again!!! I get all kind of refusal pop ups, asking I should be 'authorised' to copy or open files...? Now I found that having worked a database on my laptop and copied the files to my W7 PC the files have the new date+time indication but upon opening don't show the revised data! It is still the old file! I paid for this monstrosity, am the only user on this PC and still cannot accept to do what I want it to do! 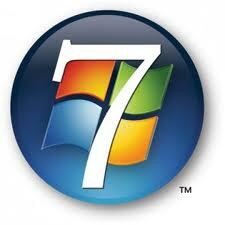 I wish the designers jerks at Microsoft every possible mental depression and an ever decreasing marketshare for Microsoft. Fibre-optic cable is being put in the ground, preparing for HDTV and on-demand-television, so one selects a movie or documentary on tv from a library when one feels like it. At a cost of course, because all this digging and miles and miles of cables is quite an investment.